Goat milk soap making is becoming a popular hobby, and with good reason. Goat milk is very soothing and gentle to your skin. While there are many recipes on the Internet for making goat milk soap by the cold process method, you can also easily make a melt and pour version. This method is perfect for beginners and makes a great craft for children. Additives like oatmeal, herbs, etc. Melt the goat milk pour and melt pieces in a double boiler or microwave. Add the coloring, fragrance, and any herbs or added ingredients. Pour carefully into the molds you have chosen. Tap the bottoms to get out air bubbles. 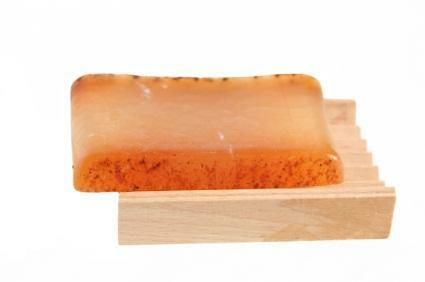 Unmold your soap by gently popping it out of the mold. Cold process or no cook goat milk soap making takes a little longer and is a little more complex, but most aspiring soap makers eventually want to try their hand at this technique. Two stainless steel pots used exclusively for making your soap - label one for lye mixing and the other for heating oils. If you are not an experienced soap maker, you will want to get a book on soap making and make sure you understand the steps. Working with lye can be dangerous, so be careful. Add the lye to the goat milk. It will turn tan. Stir in all the lye carefully, and allow the mixture to stand for ten minutes. The lye mixture will look curdled. Mix the oils together, and add the lye mixture to the oil mixture. Mix well until it begins to trace, or leaves a line on the top of the soap mixture when a little is dribbled on top. Add fragrance, colors, or other additives. Pour carefully into molds and let it set up for 24 hours. Cut the soap carefully, watching for areas of liquid lye. These can splash and burn your skin. Cure the soap for four to six weeks. Soap making supplies can be found in local hobby and craft stores as well as online. You should be able to get lye at your hardware store or even in the cleaning section of the grocery store. Make sure it is 100% lye. Goat milk soap can be made from fresh or dried goat milk, or even melt and pour goat milk soap pieces. It is a beautiful and gentle soap that makes excellent gifts as well as being wonderful for your skin. Always remember that lye is very caustic and can burn or blind you. Make sure you understand how to mix and use it before making any type of soap that contains this harsh chemical.